It’s a simple concept which I choose to live by. After all, I choose to live simply. You don’t have to wonder what I mean when I say something because I say what I mean, and I mean what I say. There is no manipulation or hidden meaning. I’m not passive agressive. I just live simply. Ok, so I made up the “#368.” See? Simple. 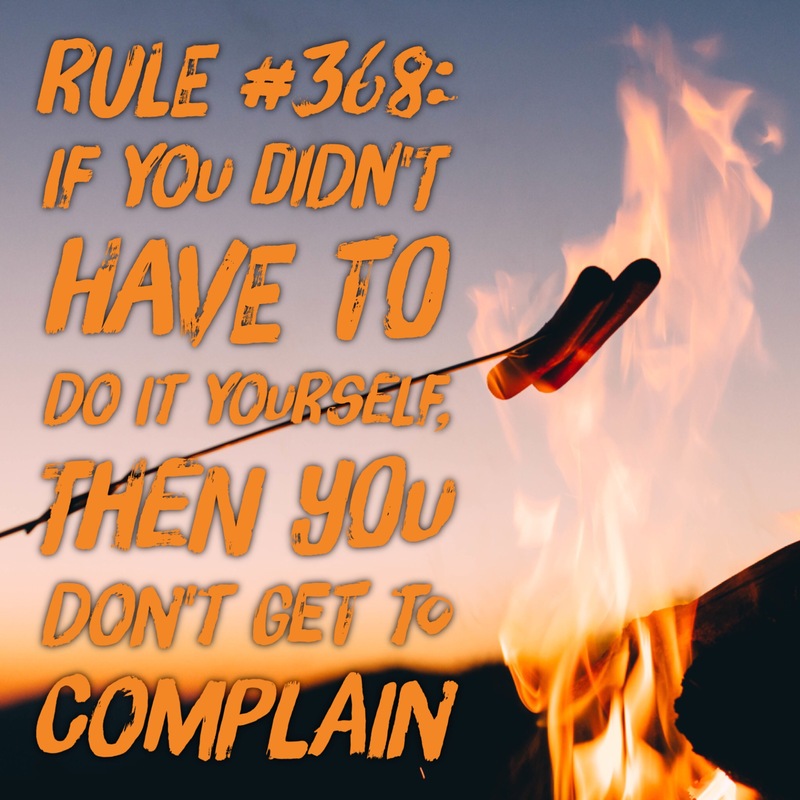 And when it comes down to a simple-living tip we could all use, I like #368… “If I didn’t have to do it, then I don’t get to complain.” I’m sure someone out there will find some situation in which this doesn’t play out, but generally speaking in life, this has worked out well for me. It’s best illustrated by who’s cooking at our house. PR31 basically does all the cooking. The only time anyone wants me to cook is if she is not feeling well and unable to make it to the kitchen. Apart from that, we love eating her cooking. She is a terrific cook! I’d rather eat her cooking than any restaurant around. It’s down-home cooking, too… southern goodness with a somewhat whole-food twist. Now you would just have to know her to understand what I’m about to say… but she wants to make sure what she cooks for us is just right. She is not okay if something gets a little overdone on an edge… She would rather re-make something than to serve her family something less than wonderful. It’s probably what makes her cooking so delicious. Me: Hey, did I have to make it? Me: (interrupting her before she can finish her reply) You know the rule… If I didn’t have to make it, then I don’t get to complain. PR31: Yeah, I hear ya, boy. I don’t just apply this principle to meals cooked by my sweetheart. I believe it applies to other acts of kindness by others toward me. And it doesn’t stop with those I can see with my eyes, touch with my hands and hear with my ears. I apply it to my salvation. I didn’t pay for my rescue from hell… I didn’t earn my adoption into God’s family… I didn’t work hard enough or long enough to get God to bless me so abundantly. God did it for me. So I don’t get to complain when He gives me some guidelines to live by. And I don’t get to complain when He asks me to say something to someone in a store… or when He asks me to do something that takes me out of my comfort zone… or when He asks me to give some money which I think I’d prefer to hold onto. I didn’t have to do salvation for myself, so I don’t get to complain when the journey doesn’t play out exactly the way I envisioned it would. Some people can’t fathom living this way. They want it their way, right away. And then they want to complain if it’s not absolutely perfect. Leadership experts say that a good leader will hand off tasks that their team can accomplish at 50%-80% of the ability of the leader who assigned it, and the leader has to be okay with that because it freed them up to tackle tasks that were more important for them to accomplish. It’s about having an attitude of gratitude. It’s about appreciating those who help do something for you so that you don’t have to. So, if your kids fold the clothes and don’t get them perfectly straight or put them in the wrong drawer… Rule #368. If your spouse cleaned the bathroom and missed a couple spots… Rule #368. If your administrative assistant filed something in different way than you would have… Rule #368. If the volunteer serving at your local church didn’t get the bulletins folded perfectly, but it saved you from having to do it and you were able to spend time with someone who really needed you… Rule #368. What if we all began to live by Rule #368? What if we complained less and appreciated more? Hmmmm… Seems like life might run a little smoother and people would have less stress in their lives. The call to action today is to complain less and appreciate more. And one simple way to implement that in your life is to apply Rule #368. Really been enjoying your blogs/posts/words of encouragement and inspiration….. keep up the great work Allen! Thanks so much! Will do!! !